I have seen that Al Cant Hang is already slyly advertising that the BBT4 is coming. I do NOT know if the Skillz Game will be a part of it this time around currently. I am sure Al has everything in the works. Updated Leaderboard (Final 2008) - There will be two leaderboards starting next week, the 2009 leaderboard and the Top 10 Overall since I took over the Skillz Game. Both little Katie (26 days old now!) and I have chest colds, so if I manage to actually play, I will be donking off chips I am sure. If I dont, have fun stealing my chips, as I am already registered. Please check out Vinnay's blog for more about this tragedy that happened on Christmas Eve, or check out the blog that was made to help out: Help Jeff Out Lend a hand if you can, Thanks! So basically we have determine if Pirate Lawyer isnt winning this, then Lighting is, and PL finished 2nd. Nice of them to leave 3rd place money for someone else (muhctim with his 2nd cash). And your bubble boy?? Me, of course! Lets see if either of them can do well in Razz net week. Another Tuesday, another Skillz Game. And tonight there is no Bodonkey, so come out for some Double Stack Fun!! And this time I will almost certainly be late, so here is your chance to steal some of my chips before I get home to play. That is the question I am asking myself lately. I really enjoyed the Bodonkey series, and now I have over $200 on Bodog, or that is where I was as of yesterday morning. I decided to use some of my $T to play a couple of tournament. First I tried to satellite into the 100K, but fell short. After watch my Redskins stop the Eagles, I wanted to play another tournament, but I didnt want to be up all night with work and the baby (almost 3 weeks old now!). So I play the $1.5K Turbo. I LOVE THIS TOURNAMENT. I just played good strong but tight poker. 140 players, I lasted 1 hour 40 minutes. My last hand I should have let go, as I had QQ, with three all-ins in front of my. The others went all in with AJo (huh? ), 88 (short stack, so understandble), and AA (of course it was the big stack). My QQ gets beat for 1/3 of my stack by the 88 flopping another 8, and I lost the rest to the AA. My finish position? 4th!! $15+$1 buy-in, paid me $168.00 for 1 2/3 hours of work. And I push myself to over $350 on Bodog, where 2 months ago I had only $40. Sorry for the late update. Work tilt for my job this time of year, just another reason why I did not make the Winter Blogger meeting. Pirate Lawyer pads his lead even more with this PLO8 Win. 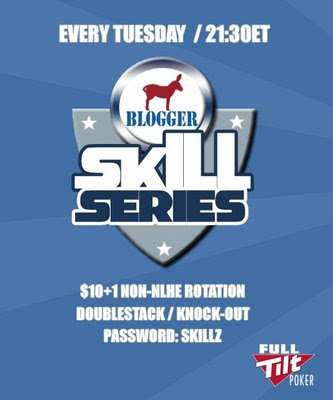 Skillz game tonight is Pot Limit Omaha Hi/Lo. Bodonkey is the 15th of 15 tournaments for points to qualify for the final on Thursday. If I dont qualify tonight (I am currently in 10th overall), then I am out, as I can not play in the 2nd chance tournament for one of the three additional seats tomorrow night. Played in the 14th of 15 Bodonkey tournaments last night, having actually played all but one of them, with the birth of daughter being the one miss on Dec 4th. Going into the tournament I was 10th on the Leaderboard. I looked that there had been about 75 people that have played in the series so far, so I was guessing Top 12 or 13 get into the final before the last chance tournament. I focused last night on not overplaying AK, which I layed down a few times to when they did not hit the flop or turn, with no draws. With only 27 people playing I knew I would have to finish at least 8th to get any point. When we finally got down to the final table, the two players directly behind me on the leaderboard were also at the table, and with many more chips. I played good smart tight poker, and watched people taking chances with questionable holdings (IMHO), and managed to get myself all the way up to 4th place. I did finally push all in with AK, and was called by two players. An Ace on the flop and a bet by WilWonka pushed out TonySoprano, and my AK was ahead of AQ of WilWonka. Wasnt strong enough though, as the Q came on the turn, and I go out just off the money (although I did get my buy-in back). The Bodonkey has been +EV for me, as it looks like regardless of if I make the final tournament, I will be up about $100.00 over the course the tournament. Nine players this week, with me actually managing to cash (3rd place). Added more points in Bodonkey this week by finishing 7th of 44, moved up to 10th overall. Hope to see many of you out here. If nothing else to try and bust Waffles on his goal to take over the leaderboard of this and a number of other Blogger tournaments by the end of the year. Katie was born at 8:53 AM on Thursday Dec 4th. She is 7 lbs 7.3 oz. She is 20 1/2 tall. And she already has her Daddy wrapped around her finger. 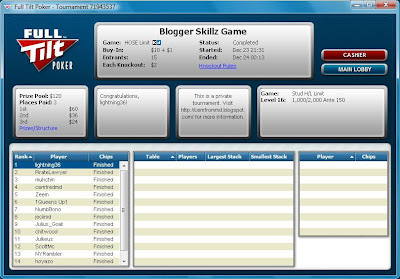 Skillz Game Results & The New Addition to the Moser family comes tomorrow!! Lightning got the Skillz Game win for one of my favorite games, Limit Hold'em. Next Week is Limit 7 Card Stud Hi Only. I will not be playing any this weekend, as my wife is giving birth tomorrow (Dec 4th), and we will be at the hospital this weekend. I hope to have pictures soon! This is actually one my best games, and I missed the last two times it was played due to other events in my life.